History is not a single narrative and the stories of those who oppose war add another layer of complexity to the national picture of World War I. From those who undertook relief work to those who refused to take any part in the machinery of war, the stories of people who refused to fight counter the widely-held belief that the whole country was behind the war. Then, as now, it is important to remember that British involvement in overseas wars is not universally supported. The centenary of the ‘war to end all wars’ provokes uncomfortable questions about Britain’s involvement in conflicts around the world. When remembrance events are sponsored by arms companies and poppies are worn as fashion accessories, it is difficult to focus on remembering the human cost of war and working towards the ideal of ‘never again’ over the call to support the military in current wars. War resisters in 1914 came from many different backgrounds, citing political, religious and moral objections to fighting. But their stances are widely misunderstood. 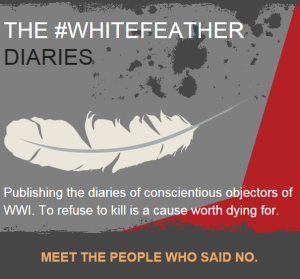 As part of the centenary commemorations Quakers in Britain launched a project called the white feather diaries. The diaries tell the stories of those who chose not to fight, featuring extracts from their writings including letters, journals and memoirs. They focus on overlooked aspects of the war: resistance to killing and the relief of suffering. The title refers to the symbol of cowardice given in wartime to young men not in uniform to shame them into enlisting. Opposition to war takes many forms and did not start with the outbreak of war in August 1914. In the years leading up to the war, peace activists were vocal about the government’s increasing military expenditure and a number of peace organisations were founded, including the Friends Peace Committee in the 1880s and Northern Friends Peace Board in 1913. There was widespread opposition to compulsory military service in Britain. When conscription was introduced in 1916, conscientious objection was one of the grounds for exemption. For Quakers opposition to war is a matter of faith. Quakers originally declared their peace testimony to Charles II in the 1660s, but since their exemption from a national militia in 1757, Quakers had not been tested on the strength of their opposition to war when faced with conscription. World War I then was a pivotal moment in the history of the Quaker commitment to peace. Around 30% of eligible Quaker men enlisted, believing themselves called by duty to do so. Others worked to relieve suffering at the front or registered for exemption as conscientious objectors. In the first weeks of the war, a group of passionate, young Quakers set up the Friends Ambulance Unit to provide relief from suffering on the frontline. They faced public criticism for not enlisting and opprobrium from other Quakers for indirectly supporting the war. At home in Britain others worked with relocated refugees and set up schemes to help ‘enemy’ nationals held in internment camps. Hilda Clark, one of our white feather diarists, helped re-found the Friends War Victims Relief Committee. It assisted refugees and internally displaced persons affected by the war. For Hilda working to relieve the suffering of civilians affected by the war was a way of living out her pacifist beliefs. It was the legacy of conscientious objectors that helped shape a new understanding of opposition to war. Often called ‘extreme’ and described at the time as ‘cranks’ and ‘shirkers’, these were the people willing to sacrifice their careers, their friends, and even their lives for their principles. As Bert Brocklesby, another of our white feather diarists, said at his tribunal “It would be a pity if, while there are so many thousands who are ready to die for their country, there are not some who are ready to die for higher principles.” Bert became one of 34 men to receive a death sentence for refusing to obey military orders, later commuted to 10 years penal servitude. After the war conscientious objectors struggled to find work due to the stigma attached to their wartime stance. They were also disenfranchised by the same Act of Parliament that extended the right to vote to all men over the age of 21 and all women over 30. Those who opposed World War I are also part of our national story. The 16,000 or so men who claimed exemption on conscientious grounds in WWI became 61,000 in WWII. In 1948 the UN Declaration of Human Rights included the right to freedom of thought, conscience and religion, which includes the right to conscientiously object to military service. The ‘war to end all wars’ did not succeed in its goal. 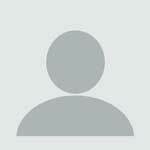 21 years later World War II broke out and Britain has been involved in numerous other conflicts since 1918. The cry of ‘never again’ echoes across the 20th century but ‘never again’ is a call to action. It is a call to challenge war and the preparations for war, and to work for peaceful solutions to conflict where it occurs.